Mikayla Steele always admired different painted parking bumpers around York when she came to the city. She knows a lot of the kids who painted them and hoped to someday paint some herself. An avid participant with YorkArts, Mikayla comes to York almost every weekend. Next time she visits the city, the Spring Grove Area High School junior will be able to admire her own work. 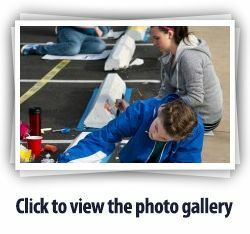 Mikayla and about two dozen art students from her school painted bumper blocks at South Queen and East Princess streets Wednesday morning, brushing satin and latex paints onto the 33 concrete structures at Big Wash Laundromat and Sun's Deli Market. The project, Bumping Up Against Art, was launched by Geron Countess, a senior at York Suburban, with assistance from The Parliament Arts Organization. Geron said she spent a lot of time in the city as a kid. Every Wednesday in the summer, she ate lunch downtown with her father who works in the city. A lot of students haven't been exposed to the city like she has, Geron said. She wanted to tie students from around York County to the city, make something beautiful and give the kids a reason to come back. Geron's project began last summer. Nearly 200 other bumpers have been painted around the city by students hailing from a handful of schools, including York College. "They're definitely eye-catching," Geron said. "I've seen people taking pictures of them, which is really exciting." Students can use templates or make their own designs, fostering a wide range of creativity. Brenna Gutshall, a Spring Grove junior, blended pink and orange to depict a sunset over a city skyline in the Big Wash Laundromat parking lot. Evan Greer, a senior, crafted a Mrs. Butterworth pattern on a cement block at Sun's Deli Market across the street. Most of the Spring Grove students were in the high school's art club or members of the National Art Honor Society, said Natalie Lamparter, art teacher and advisor of Spring Grove's art honor society. Students in the society are required to do volunteer hours, Lamparter said, often doing something creative. While Evan said his maple syrup-themed bumper block was slightly random, Mikayla's rendition of Vincent van Gogh's "Starry Night" derived out of her passion for fine art. The students paint murals in the school, said Troy Smith, who teaches art at Spring Grove, but nothing like what they did Wednesday. Painting on a strip of concrete only a few inches high and thick posed a challenge for the kids, but didn't hinder their creative flair. "It's difficult because it's rough, but it's still possible," said Jesse Barley, a junior who drew on his bumper with a black marker before painting. Not many pedestrians walked by the intersection without giving the kids and their work more than a passing glance. Mann Ly, owner of the laundromat, said the decorative bumpers made his parking lot look a little sharper and cleaner. "The kids did a good job," he said. "I'm always up for volunteering or making the city more beautiful," Mikayla said. 4. Child Care Consultants, Inc.